Zero-sum two-person games (T.E.S. Raghavan). Game theory and statistics (G. Schwarz). Differential games (A. Friedman). Differential games - economic applications (S. Clemhout, H.Y. Wan, Jr.). Communication, correlated equilibria, and incentive compatibility (R.B. Myerson). Signalling (D.M. Kreps, J. Sobel). Moral hazard (P.K. Dutta, R. Radner). Search (J. McMillan, M. Rothschild). Game theory and evolutionary biology (P. Hammerstein, R. Selten). Game theory models of peace and war (B. O'Neill). Voting procedures (S.J. Brams). Social choice (H. Moulin). Power and stability in politics (P.D. Straffin, Jr.). Game theory and public economics (M. Kurz). Cost allocation (H.P. Young). Cooperative models of bargaining (W. Thomson). Games in coalitional form (R.J. Weber). Coalition structures (J. Greenberg). Game-theoretic aspects of computing (N. Linial). Utility and subjective probability (P.C. Fishburn). Common knowledge (J. Geanakoplos). Index. This is the second of three volumes surveying the state of the art in Game Theory and its applications to many and varied fields, in particular to economics. The chapters in the present volume are contributed by outstanding authorities, and provide comprehensive coverage and precise statements of the main results in each area. The applications include empirical evidence. The following topics are covered: communication and correlated equilibria, coalitional games and coalition structures, utility and subjective probability, common knowledge, bargaining, zero-sum games, differential games, and applications of game theory to signalling, moral hazard, search, evolutionary biology, international relations, voting procedures, social choice, public economics, politics, and cost allocation. This handbook will be of interest to scholars in economics, political science, psychology, mathematics and biology. @qu:... "The list of contributors is practically a Who's Who list of Game Theory and Applications: all chapters are written by foremost authorities on the particular topics. ...I can see two main uses for the Handbook: First, its a wonderful reference source for every researcher in pure or applied Game Theory. ...Second, by grouping several chapters together one obtains the backbone for several possible graduate courses on game-theoretic topics. 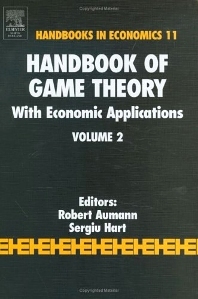 ...Let me conclude by saying that the Handbook is an essential tool for all working game-theorists and for economists interested in applications of Game Theory. The editors and authors must be congratulated for this significant achievement." @source:Journal of Economics @qu:At the top of the list of "leading specialists" are the two editors, Aumann and Hart, who are not just leaders in several research areas, but who also possess outstanding overviews of the subject and the people working in it. Their prefaces contain excellent summaries of the current state of game theory, its definition, the main problems, and general approaches. The selected 40 chapters ..... are written by truly leading specialists, and as a result each chapter gives a coherent overview of its topic, as well as up-to-date comprehensive descriptions of the known results. From personal experience I can attest to accessibility and usefulness of this handbook. Another excellent use of the handbook is for professors, with the required fundamental knowledge, to teach selected special topics to beginning students. ..."while it has become impossible for a single author to write a comprehensive updated text on game theory and applications, the need for such information has become more urgent. The first two volumes of this game theory handbook do an excellent job in meeting this need."